Parmesan breadcrumbs --- 6 Tbsp. Olive oil --- 2 Tbsp. Naan flatbread --- 4 ea. 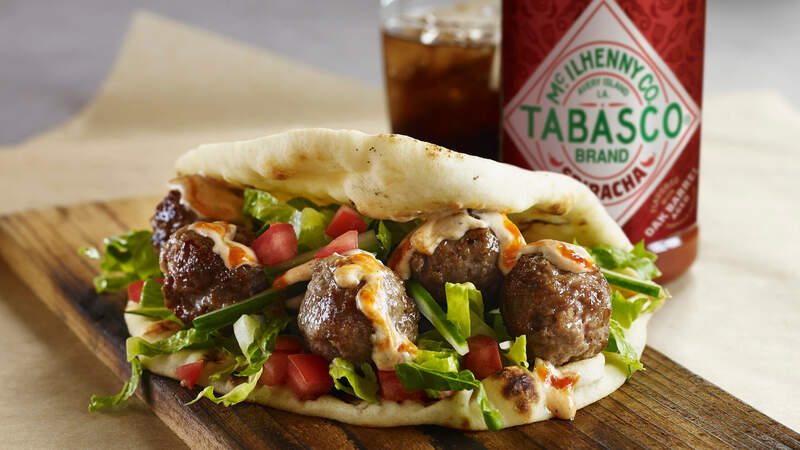 Mix TABASCO® Sriracha Sauce with tzatziki; set aside. Mix ground lamb with breadcrumbs; form 1-oz. balls. In a skillet over medium heat, add olive oil; cook lamb meatballs until temperature reaches 154ºF and outsides are crispy. Lay on paper towels to drain excess fat if needed. Onto each naan, lay romaine, tomatoes, cucumber and 3 lamb meatballs. Drizzle the Sriracha-tzatziki sauce over the top of each. Fold each naan in half, using a toothpick to hold together if necessary; serve.